I have no idea where I picked this up or why. All I know is that I found the title on my reading list last month, drew a complete blank and then decided, "Eh, why not?" So no pre-reading impressions this time, because my memory has shown its true colours for once. 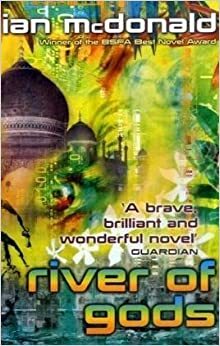 River of Gods follows a large ensemble cast of characters, all converging on the Indian city of Varanasi as it approaches the centenary of Indian independence. Together, their individual plots combining to create a story of political intrigue, civil unrest and the dawning of new technologies that no-one is quite prepared to face. There's Shiv, a penniless gangster trying to claw his way back to power; Mr Nandha, a civil servant who polices illegal AI programmes, and his wife Parvati, who is trying to find happiness in her new marriage; Shaheen Badoor Khan, a prominent political advisor and furtive admirer of the controversial "nutes"; Najia, a journalist trying to find her big news scoop; Lisa, a scientist contacted by the US government to observe a strange phenomena in space; Tal, a nute who ends up with all the wrong people at all the wrong times; Vishram, a comedian summoned back home after his father makes a critical business decision; and Lull, a once-prominent AI researcher who just wants to disappear. So, the good stuff. Holy cow, does this ever get involving. I was sceptical at first, as it does start quite slowly and does throw you into all the Indian terminology and slang. But as time went on, and these disparate characters got ever more intertwined, it just became so absorbing and interesting. There was little of what you could term wasted words, with the majority of plot points brought up returning later with greater significance and importance. If there was anything that could have been cut, then I would say that Parvati's plot thread might not have been strictly necessary; but at the same time, I would argue that she is the most normal, sympathetic and tragic of the characters presented, so she acts more as an emotional grounding, the everyday person caught up in the chaos. I know that one of my complaints in my last review, for The Difference Engine, was that it took too long to get to the plot, but somehow this gets the balance right; while I spent a good half of River of Gods wondering how everything all tied together, the way that it kept each character fresh and vivid in my mind and the regularity with which they were revisited helped to bring everything into something cohesive a lot quicker and easier than Gibson and Sterling managed. Additionally, it might just be me, but I found the change in setting to be quite refreshing. There's something about India and its culture that kind of fascinates me, so I was glad that the setting actually felt like it was in India, rather than generic American/European sci-fi set #42 with a spray of South-East Asian paint. Now I can't be 100% sure about the accuracy, but I thought that the religious divides, largely between Hindus and Muslims, in the country were particularly interesting to read about, and definitely something that I would consider reading more on. On to the more negative aspects, I thought that towards the end McDonald started to focus more on one or two specific plot threads, leaving some feeling a bit unfinished. It's not a book-breaking point, but I do feel like these characters had their closure while I wasn't looking or something. Secondly, I thought that some science fiction elements included could have been written with maybe a little more depth. For example, you find out that genetic engineering has reached the point where some children are being born who will live twice as long and grow up half as quick, named Brahmin by the population at large. Their presence in the novel seems to largely be background flavour with no real significance, but you wouldn't know it by the attention that is focused on them sometimes. Again, a pretty minor point, but it does bug me a little.